A floor cushion is handy in the living room, the kids sit on it in their room. And a cushion on the floor takes up less space than a Chair. Found on Pinterest, learn how to make a floor cushion with the recycling spirit. 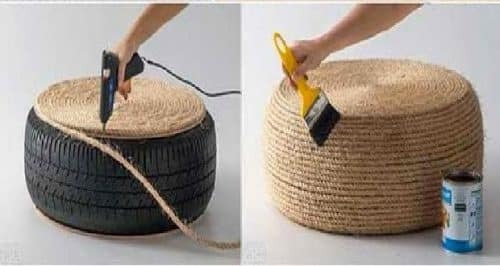 A tire will be a perfect support to serve as basis for your cushion. It is round, 5-8″ tall, which is perfect to turn it into a floor cushion. And to get a tire is easy like going to a junkyard or your dealership, or simply to recycle your own when changing those of your car. Before starting the manufacture of your cushion, measure the diameter of the tire, deduct 1 ” and then cut out or cut in the carpentry Department two round in the plywood from 1/6″ to the measures that you have obtained. To give a solid foundation for the ground cushion, screw a disk of plywood above/below the tire with one screw wood every 2″ away from the circumference. Make sure the wood is well centered to the side of the tire. The objective is to stick the rope as if you’re a roll of licorice. Hand glue gun first set in the center of the future cushion a few centimeters of rope forming a spiral. Continue in the same way up to cover the height of the pad and cut the rope on the last lap. 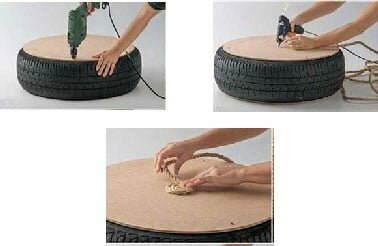 The glue being immediate, return the tire and cover the surface with the same method. Why painting the rope? To give a more sophisticated look and harden the cups. According to the used varnishes, apply one or two coats with enough drying time. Deco Tip: If you don’t have a glue gun, use a tube of glue style trim, the result will be the same. Voila, you have done a great floor cushion with almost nothing and the pleasure of doing it by yourself ! Last thing! 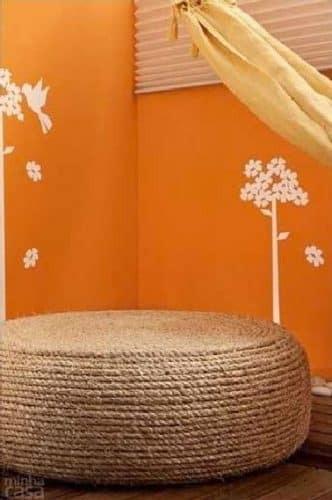 Tired of it or too uncomfortable?, this would make a good combo bed/scratching post for a cat. Thanks to our Reddit readers! Like this post? Please support us by visiting our sponsor on the right frame – Thank you!